As the World Cup Soccer finishes, we all wait for Commonwealth 2010 in New Delhi. South Africa did a fantastic job and hopefully India too will make us proud, Asiads (Asian Games) in 1982 in India went well so Commonwealth too should be fine! Though I am hoping all that construction work which we witnessed during our last trip in Dec. 2009 will be done by this month and Rajdhani will do a fab job of tidying up the place ahead of time, Here is hoping! My train of thoughts take me to Commonwealth 2006 when the torch arrived in Papua New Guinea (in Oct 2005). 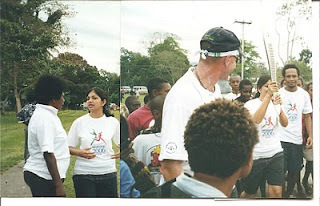 In 2005, the Commonwealth torch came to Lae in Papua New Guinea and Soroptimists were acknowledged and given a chance to participate in the baton relay. I was the President of SI Lae at that time (while working in PNG University of Technology) and got the opportunity to run a distance of 1km (approx). Naomi Wilkins a good friend, fellow soroptimist and the Past National Representative of SI PNG was there early in the morning with me (as in the photo above left, Naomi and I eagerly waiting for the torch). The torch was handed over by one of our Unitech student who ran the previous lap (as in the photo above right). The atmosphere was surreal, with cars in the front and behind , helicopter in the sky and hundreds of children and young men and women gathered...this was to be treasured for the rest of my life! I loved every single moment during the run, before and after (too) and felt proud (once again) to be a soroptimist!